Should you send a thank you note after a job interview? Yes! And now for a bit of interview etiquette. You just had the greatest job interview of your life and you want to do everything in your power to seal the deal. What do you do next? Don’t underestimate the power of the handwritten thank you note. It is not only an essential part of job interview etiquette, it is the perfect opportunity to hammer home the key points you want your interviewer to remember about you. Job interview etiquette dictates that you send thank you cards to everyone who interviewed you, even if you’re not sure you want the job. This message can be as simple as “Thank you for seeing me. I really appreciate the time.” But if you are serious about the job, it should convey much more than that. Many people forget to say that they actually want the job during their job interview. They’re so busy talking about their qualifications and worrying about the next question that they forget to say the obvious: “This position is perfect for me, and I think my skills and experience are a perfect fit for your company.” If this is you, conveying this message in your thank you card is paramount. Be sure to also mention a few of those key skills that make you perfect for the position. 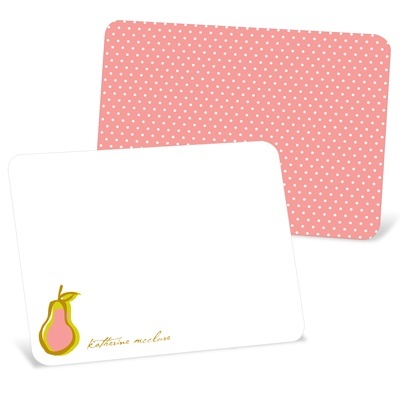 Personalized note cards are essential for anyone who is job hunting. Don’t even think about sending an email. A handwritten note makes a much bigger impression, and since it will probably be kept in your file along with your application, you want that impression to be a good one. Note cards also force you to keep your message short and to the point—if you have to write on the back or add pages it’s too long! We recommend that you write the note a few hours after the interview. This gives you enough time to evaluate how it went and figure out what you would say if you had one more minute with the interviewer. A thank you note isn’t going to turn a bad interview into a good one, but it can, at least, give you one last chance to make a case for yourself. It is one rule of interview etiquette that should not be ignored. 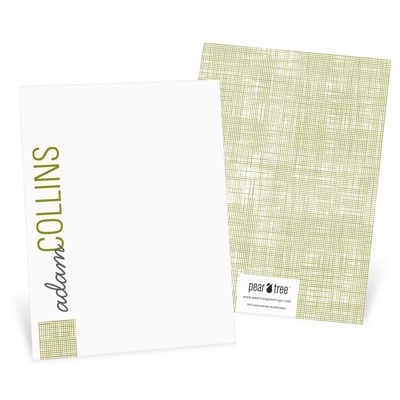 Pear Tree’s personalized note cards and DIY cards let you find a style and customize it with colors and text to be yours.